As the name suggests, The Coachman is a former coaching inn. Our strapline is “village pub and kitchen” and this is exactly what we are! Hartford has for a long time been crying out for a pub where friends old and new and neighbours could meet for a pint, meal, coffee or all three. This is exactly what we are providing. With our self-contained apartment and five en-suite rooms, we can cater for overnight stays – perfect for the business traveller looking for some home comforts. In February 2013, the pub was totally refurbished with walls removed to improve the flow within the pub, creating an open plan informal lounge/dining area with lots of wood and leather and open fires. 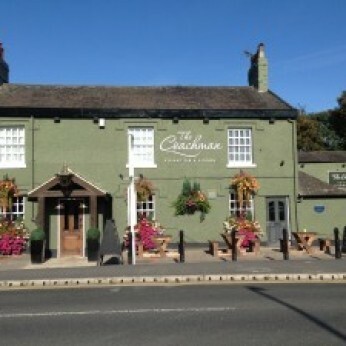 The coachman offers a wide range of excellent cask ale has a real ‘locals bar’ feel. As well as the new look interior and exterior, a new kitchen has been installed enabling the Coachman to offer traditional home cooked food . See our mouthwatering menu. There is also a lovely beer garden to the rear, ideal for alfresco wining and dining. Commuters using Hartford rail station can drop in for coffee and meals from Mid day. We also do coffee to go!